Each day, I’d cheer her on as I witnessed her grow in confidence and skill with every new painting posted. 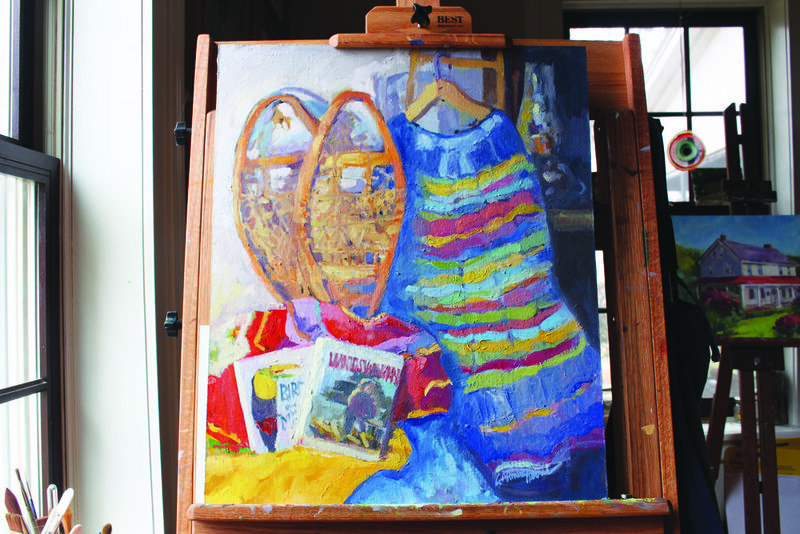 It was clear that the simple challenge of picking up her brushes and capturing daily life was helping her forge an even deeper connection to her art. I was a passive observer then. It was time to change that. This year, I committed on the first of January and every day posted a painting from life. While I would have loved to be roaming the Finger Lakes capturing different scenery as winter unfolded, I’ll be honest: I’m not one for painting in frigid temperatures. So my easel and I set up in the light of my own home, cleverly arranging still-life subjects I’d collected over the years. For at least 30 minutes each day, I was fully dedicated to bringing these still-life subjects to life with my brushes and paints. I found joy in going through old things around my home, writing stories about the objects in my head, then arranging them in different groupings to paint. At first, it was exciting. A new challenge! Then a few days passed, and I faced some serious internal battles: Was my work good enough to post to 3,500 people? Can I really do this every day? Is this really something I need to be doing? Fear and ego reared their ugly heads, and threatened to stymy my progress. Yet the same resounding answer came up every time: Yes. Yes, you can paint every day. Yes, it’s good enough to post. While I didn’t necessarily need a new easel (I love my Open Box M), this challenge brought out the best in me. Some days, I worked early in the morning before the sun came up. Some days, it didn’t happen until late at night. It took away all excuses -- whether tired, busy, or simply apathetic, I made the time to paint every day. It helped me further eradicate “later” from my vocabulary. And it helped me consistently practice a stronger connection to my art for 31 days straight. For me, art is my meditation. It’s my prayer. It’s my livelihood. Making time to honor and connect with it each and every day is crucial to helping me forge my path, find my voice, and leave my mark on this world. I’m continuing my practice through 2019, knowing there will be days I will falter. Those days, I sketch in my sketchbook or read an art book. It doesn’t always look the same, but the connection is there. For you, this might mean seeking a deeper connection to your writing. Your baking. Your music. Whatever your “art”; whatever it is that fills you up -- honor it. After all, if it’s something you love, it deserves more of you. And you of it. In connecting with our art, we connect on a deeper level with ourselves. And that, friends, is something worth perpetually seeking. P.S. This is the second post in my “words of the year” series. I’m thrilled to have you here as I explore incredibly important guiding principles for those looking to make change in the world: Connection, expression, and purpose. Last month, I encouraged you to connect with the people who fill you up. I love to knit. It’s relaxing. It’s cathartic. It’s a release. Oftentimes when I knit, I passively consume content -- a TV show; a movie; a podcast. Other times, I sit in silence, mindlessly moving the yarn through the needles. No matter the nature of the knitting session, I never fail to be enthralled with the loops coming together, twirling around each other; the sum of parts connecting to become whole. For me, it’s a practice in connection. As we turned to a new year in 2019 and I considered what I wanted this year to bring, it was deeper connection that I was eager to seek -- connection to my people, my art, my environment, and my roots. For me, connection is a big part of both becoming and belonging. And while connection can be sought -- and found -- in the most solitary of situations, there’s much to be both given and taken in our connection to others, particularly beyond the digital realm. Make time to connect with the people who fill you up. These are the people who truly see you. They believe in your dreams, and your ability to reach them. They inspire both through their words and in their actions. Perhaps most importantly, they share a mutual love and sense of gratitude for you, as you do them. Make time to connect with the people you can learn from. These are the people who have knowledge you desire. They live in a way that you wish to live, represent values you aspire to, and have traits you admire and wish to emulate in one way or another. These people encourage you to better yourself in mind, body, and spirit. Make time to connect with the people you can teach. These are the people thirsty for your knowledge. They’re the curious spirits who will inspire you to share what you know, who you are, and what you believe. They’ll encourage you to stay on your path to bettering yourself. Through their curiosity, they’ll inspire you to stay curious. Ironically -- or maybe not so -- when you seek to form a greater connection to people who fill you up, you’ll also find that you can learn from and teach them. And when you make time to connect with the people you can teach, you’ll find that they also fill you up and teach you, in the process. It’s a network where loops continuously come together. Where knowledge, encouragement, and kindness twirl around each other. Where the sum of parts create a unique whole. For me, I seek to connect more wholly to to the powerful women I surround myself with, creating a more inclusive and accepting future where all voices matter. I aim to connect on a deeper level with the painters and mentors I workshop with each week, who have an eager thirst for knowledge and a persistent pursuit of practice. I seek greater connection to the creative business owners in my physical and digital ecosystems, who believe in living life on their own terms and leaving a unique mark on the world. I crave true connection to my friends; my spiritual groups; my family. This year, more than any before, I will make the time to fulfill these connections. These people fill me up. They teach me. They inspire me to teach them. Through these connections, I become a better version of myself. Who will you boldly seek connection to this year? P.S. This is the first post in my “words of the year” series. In 2018, I explored the mental muscles all artists -- and human beings -- need to thrive: Courage, curiosity, and persistence. I’m thrilled to have you back here in 2019 as I explore incredibly important guiding principles for those looking to make change in the world: Connection, expression, and purpose. A few weeks ago, I was having a conversation with a close friend. Unfortunately, she’d lost her job a few months ago, and we were talking about what’s to come next for her. The search for another full-time job in marketing wasn’t turning up fruitful, for more reason than one. The thing holding her back the most? Was that she didn’t want to give up her passion: creative writing. We dug into possibility after possibility until we landed on something that brought the spark back to her eye: What if she found a job she could work three days a week, and continue her own writing the other two days a week, letting the journey unfold from there? We had to let go of the all-or-nothing approach to see the possibilities. Call it a bridge job; call it robbing Peter to pay Paul...but until we let go of the idea of having to settle for one, 40-60 hour/week job as an employee executing others’ dreams, we couldn’t get to the more ideal solution: taking on the “necessary” to fuel the passion. With a part-time job, she could reliably contribute to her family’s financial goals, continue gaining experience, and make new connections. And it would leave her ample time to dedicate to her own creative work that rejuvenates and fulfills her. Is this the solution for everyone who wants to pursue a passion? Likely not. Yet, after having this discussion with my friend, I realized it’s exactly what I’ve been doing for the last few decades of my life. I dreamt of being a painter. Yet, not seeing that as a viable career to begin with, I dedicated myself to a corporate design job. That design career evolved into my own business -- one step closer to pursuing my passion. Yet, painting remained an easily pushed-aside hobby. It took decades for me to realize that my graphic design work has been my prolonged version of a “bridge job” -- it’s how I “rob Peter to pay Paul.” It’s been the steady foundation as I’ve finally dove into my passion and made painting a part of my daily life. When your passion feels out of reach, it’s paramount that you practice persistence in pursuing both the “essentials” and your dreams. For most of us, pursuing our passions with reckless abandon simply isn’t possible. Yes -- it’s incredibly important that we keep dreaming; keep reaching; keep pursuing that which we feel passionate about. But for most of us, it can’t be an all-or-nothing approach: We can’t give up a steady income to paint en plein air around the world. We can’t sacrifice health insurance for our families to open up the brick-and-mortar florist shop with a massive bank loan. We can’t simply sell off all our possessions to pursue a life of mindfulness in an ashram. At least right now. But with the persistence to do what you need to make the money, create the space, and garner the knowledge to execute your dreams, you can find the balance and eventually tip it in favor of your passions. Courage is the catalyst. Curiosity is necessary. And persistence is essential. P.S. If your passion is something you’ve tabled, you’re not alone. Today, I challenge to ask yourself this, though: Is “later” a bad word? 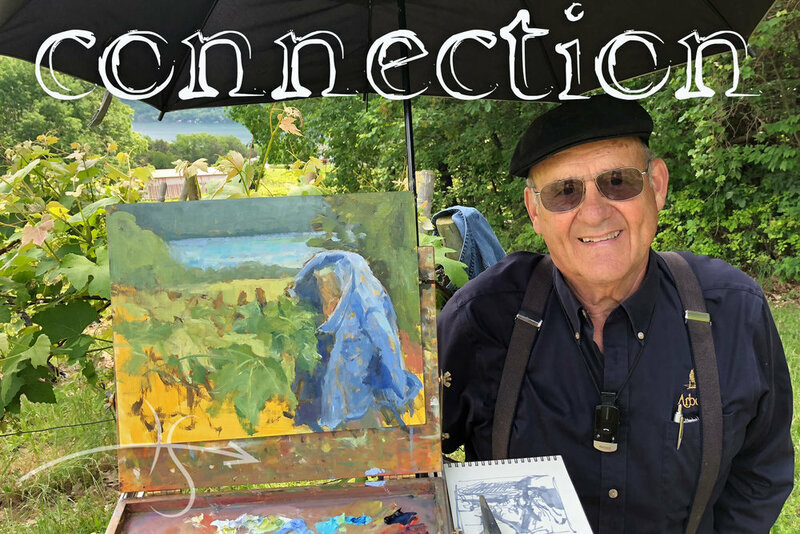 Earlier this year, I pushed past my comfort zone, my fear of rejection, and my vulnerabilities and applied to be a Juried-In Artist in the 2018 Finger Lakes Plein Air Festival. This was a leap for me. Though I’d been awarded an Honorable Mention during the 2017 Community Paint Out at the same Plein Air Festival, I hadn’t been accepted as an artist despite having been on the roster in the past. It was a setback that took a while to overcome. As I muddled over the idea of applying again, I knew I was putting myself in a precarious situation: I could be rejected. I could be submitting myself to another year of wondering why I wasn’t accepted. I could be asking for yet another heavy dose of lingering imposter syndrome. Or, even worse (though I didn’t realize it at the time)...I could be accepted. Enter: A new starting line in building confidence. I’ll be judged against the best of plein air painters. Am I really good enough to measure up against these professionals? Can I truly be ready for this again? Yes, I’d gotten in. I’d reached the finish line I initially set out to achieve when I decided to take the leap and apply. But...maybe I just fooled everyone. I was facing yet another starting line in perpetuating self-confidence. Amidst the rollercoaster of emotions that accompanied this acceptance, my mentor and friend Lori Putnam sent me the quote above, which promptly made its way onto my blackboard. The key to stepping into my creativity and embracing my talent wasn’t going to come from comparing; from trying to measure up; from judging myself against others. I had to come out the other side -- my side. So I did. I continued to go to my Wednesday evening classes. I scoped out both old favorites and new-to-me locations around Ontario County at different times of day to witness the light. I put brush to easel nearly every day, embracing persistence and slowly letting go of fear. I felt like I’d crossed yet another finish line: I believed in myself. I was painting how I wanted to paint. I was pushing myself further than I ever had before. Yet there was still another hurdle to overcome: The Festival, itself. Morning, noon, and night for nearly a week in June, my mind, body, and soul were dedicated to painting. It was simultaneously exhausting and re-energizing. I was at yet another starting line. Was I nervous? Absolutely. Did I have doubts? Of course. Was I wondering if I’d fooled everyone? Oh, yes. It seemed every moment came with a new hurdle. Yet once in the zone, nothing else mattered. I was doing what I love. I was surrounded by others doing the same. There was no win or lose here -- there was joy, growth, and gratitude. Despite the tiredness that seeped into my bones, I saw how the artists who travel these circuits are persistently building their self-esteem, their confidence, and their skill. By putting themselves out there. By doing the work. By continuing to put one foot in front of the other at each and every new starting line, no matter the critiques, rejections, or imposter syndrome they encounter. It’s up to me to do the same. 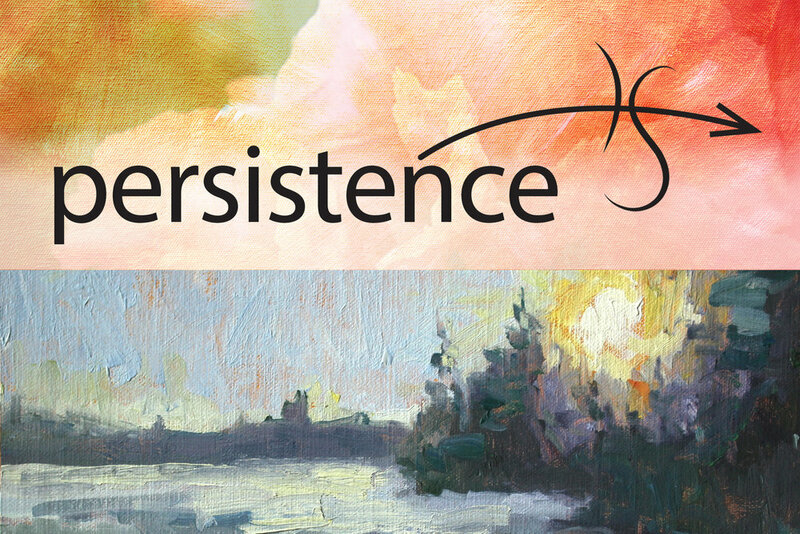 In this experience alone, it’s so clear to see why persistence matters so, so much. We need to celebrate our wins -- then we need to lean into what’s next, understanding that life doesn’t have a single finish line; only a perpetual journey ahead. It’s up to us to embrace it, and the persistence necessary to not just survive, but to thrive. I’ve heard -- on more than one occasion and in more than one way -- that if you really want to learn a skill, teach a class. Yet it was just a few months ago that I taught my very first class. It’s true, what they say: Teaching sharpens your own skills. What I’ve discovered though, and what’s keeping the spark alive for me to keep teaching now and in the future, is that teaching is also a phenomenal way to stay curious. When we teach for others, we have to let our biases go. We have to consider how others learn. We have to identify that which we don’t know, and be willing to explore it. It’s this perpetual state of curiosity we have to stay in as teachers that has me fully in love with being one, myself. In my first class that I taught, for example, I had six students gathered in the Pat Rini Rohrer Gallery in downtown Canandaigua. We were riffing on the basics of plein air painting. Basics I’ve known, practiced, and honed over decades now -- yet teaching them to people learning for the first time inspired me to get curious about what those basics really are, how they might be interpreted differently, and what’s really important. I had to get curious about things I’ve practiced for so many years. The materials we choose as painters. The way we interpret and use light. The application of strokes on a canvas. When we teach, that which has become second nature to us suddenly becomes the subject of our curiosity -- and rightly so, as we seek to influence and inspire others. As humans, it’s all too easy to fall into patterns and routines. These aren’t always bad -- but they often stop working for us long before we’ve realized it. Consistent questioning (what I like to think of as perpetual curiosity) of things so ingrained in us might be frustrating in some instances, yet it’s truly the only way to keep growing. Teaching inspires that curiosity. Curiosity is fuel. In order to keep creating, to keep growing, and to keep thoroughly enjoying the journey, it’s imperative that we stay curious. Read a new book. Find a mentor. Teach a class. Find the curiosity catalyst that works for you, and make it a regular part of your life -- it’s perhaps the best way to bulletproof our creativity in a noisy world. Creativity is an interesting thing. It’s at once both incredibly social and entirely isolating. Our creativity inspires us to put work out into the world; to collaborate with others; to find ways to bridge the chasm between people and ideas. And yet...the creative journey can often feel like a lonely one. A journey where much of our time is spent in our own heads; with our own thoughts; with our own limitations. I’ve felt this when it comes to painting. As much as I (and you!) 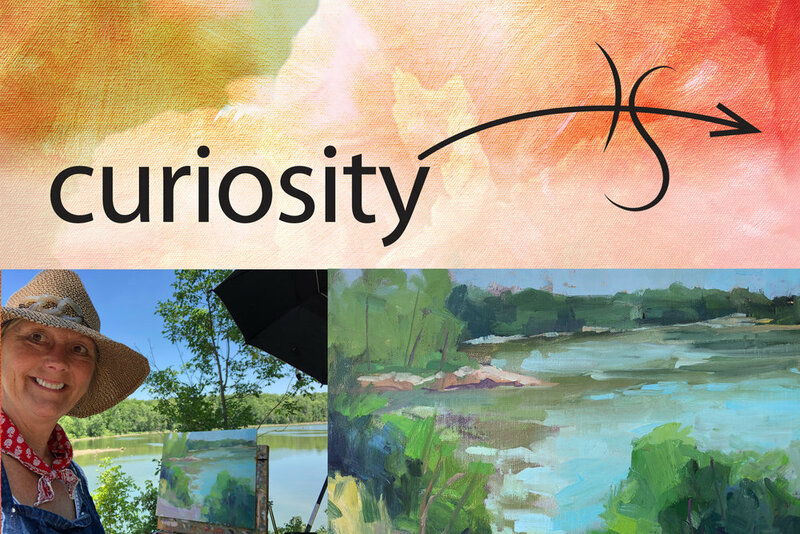 might enjoy it, spending a significant amount of time with only our easel and brushes out in nature or within our studios -- the isolating side of creativity -- can be confining when it comes to expanding our curiosity. 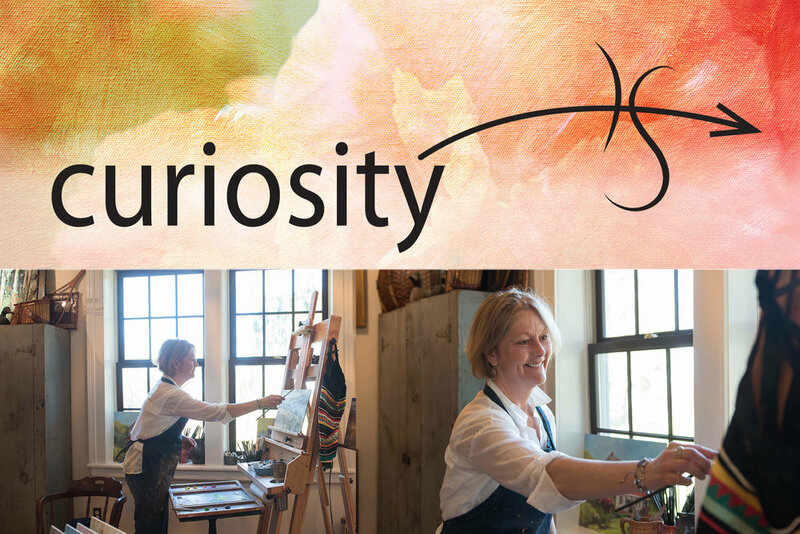 Knowing just how important curiosity is to this soul-filled, artistic journey, the idea that doing what I love most -- painting -- might actually stifle my curiosity if I perpetually do it alone has led me to build up a repertoire of catalysts for curiosity. A few weeks ago, I talked about how I let my curiosity both guide and be guided by books. 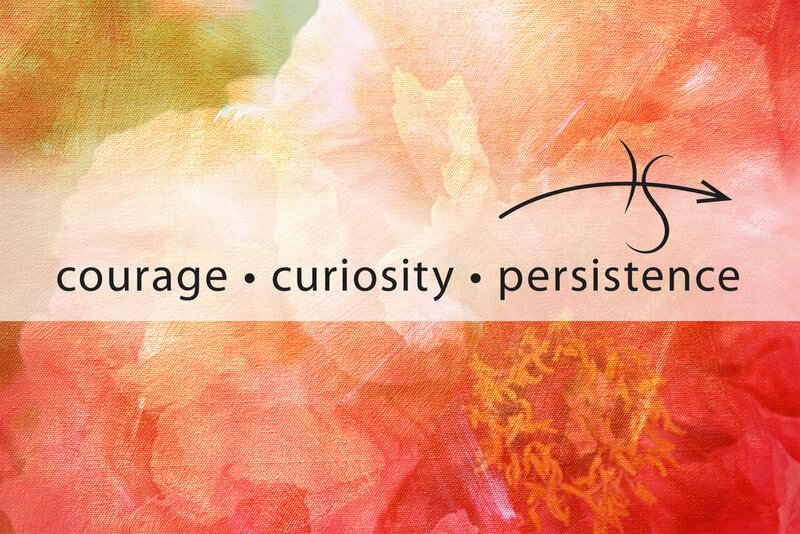 This month, I’m talking about another external catalyst for curiosity: Finding a mentor. Years ago, I didn’t necessarily set out to find a mentor. I did, however, soak up every educational opportunity I could find to enhance my painting skills -- taking classes and workshops from a plethora of people who’ve come through the Finger Lakes area, or whom I’ve traveled to see. Through these classes, I realized one thing: While workshops are fantastic for practice and expansion, there is nothing quite like the experience of studying under one specific guide who knows your work on a deeper level and is present in your life and work consistently. It was through this realization that I worked up the courage to ask Lori Putnam, an artist whom I’ve admired for years and whose work I most resonate with, to be my mentor. She’s created beautiful works of art; she’s led workshops and retreats around the world; she’s went from graphic designer to full-time painter. All goals I have of my own. I’ve now been fortunate to call her my teacher, my coach, and my friend. But most importantly, she’s emerged as an amazing mentor. A mentor asks the right questions. A good mentor won’t just affirm what you’re already thinking, planning, or doing. A good mentor will ask questions that can broaden, clarify, and amplify your thoughts, plans, and actions. A mentor speaks your language, but pushes you past your comfort zone. I’ve taken classes from potential mentors who inspired nothing but confusion. A good mentor will understand your language, and be able to speak in it -- but not to the point of confining you in places where you could expand. A mentor knows the present and future you intimately. A good mentor knows your work; your goals; your true aspirations. Even if you haven’t had hours of one-on-one time with this mentor, they’re the type of person who gets you -- maybe they’ve been where you’ve been, they’ve gone where you want to go, or they’ve worked with others who have. None of us can embark upon life alone. Likewise, no creative can stay curious -- and let that curiosity guide unlimited creativity -- without a healthy amount of outside influence. When you have the opportunity to create, make something. When you have the opportunity to study, learn something. When you have the opportunity to be mentored by someone who can help you expand beyond even your own imagination, run after it with all you have. P.S. If this resonates with you, and you're a painter on your own journey, I highly encourage you check out Lori Putnam's online learning and mentorship programs. The dog days of summer -- perfect for early morning strolls, late night bonfires, and mid-afternoon naps. Of course, there’s still work to be done, but the longer days and cooperative weather make it so much more enticing to take a bit more time for ourselves. Here’s the beauty that I’ve found: Self-care and professional development don’t have to be mutually exclusive. One of my favorite ways to combine the two? Reading. Much like painting each and every day expands my artistic skills and my portfolio of work, taking time to read each and every day expands my mind, my knowledge, and, perhaps most importantly, my curiosity. Likewise, just as I have a toolbox for each painting adventure I embark upon, I have books to turn to in order to expand various pieces of my mind and creativity. ...entirely depends on where my curiosity leads me at any given moment. 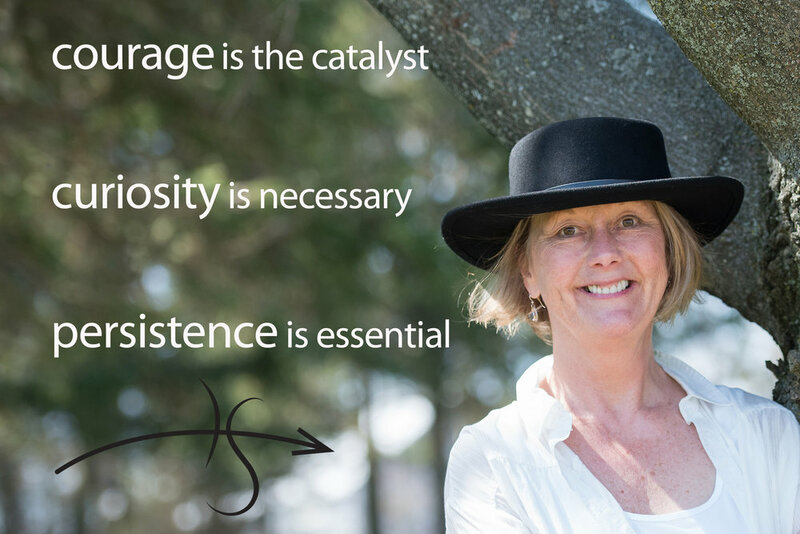 This past winter, I dove heavily into Tami Lynn Kent’s Wild Creative and Wild Feminine as I sought to explore the balance of yin and yang and the energies driving my creative work and soul. 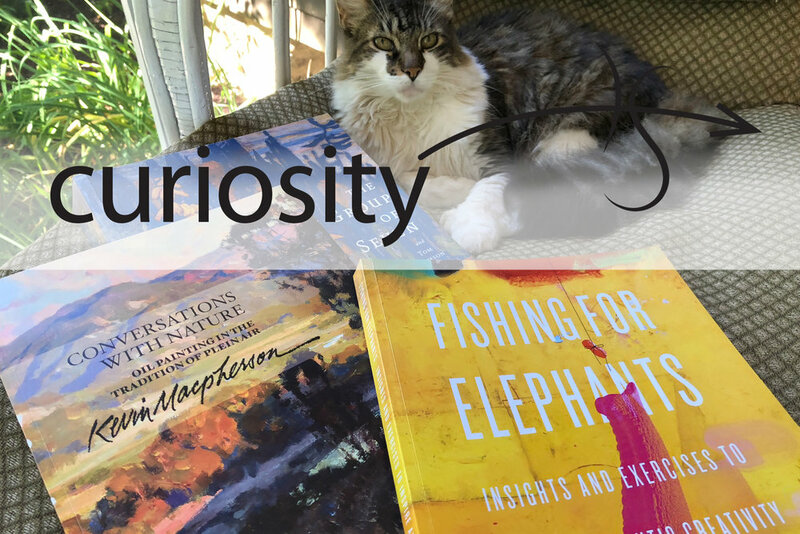 This past spring, upon finding out I’d been accepted into the annual Plein Air Festival in Canandaigua, I dove into books like Fishing for Elephants and Conversations With Nature to fill my whole self with mind-expanding plein air ideas. On the regular, I refer to books by Sorolla, O’Keeffe, Wyeth, and so many others to admire their paintings and let their accomplishments inspire my own. ...is always expanded curiosity. Reading Anne LaBastille’s books led me to get curious about her lifestyle and her way of showing up in this world. Reading and working through Fishing for Elephants led me to get even more curious about how I could push myself beyond my limitations. Reading Conversations With Nature immersed me more fully into the curious world of plein air painting -- a world both full of and completely without restrictions. Even books not directly related to our work give us the ability to expand our perspective, travel without getting on a plane, and get out of our own skin for just a little while so that we can carry that other-worldly perspective into our day-to-day lives and work. For me, books are an unending supply of curiosity firestarters. Whether it’s the dog days of summer or the darkest nights of winter, I encourage you to cozy up and make time for them as your companion in your creative journey. P.S. Stay tuned. I’ll be dropping in soon with two more catalysts for curiosity that are sure to enhance your creativity. In the meantime, don’t hesitate to drop me a note with what you’re reading! I can’t see where you were at that point, but perhaps you can relate to where I was: I was a young professional still new in my design career, with corporate ladders to climb and two young kids at home. I had my sights set high at work. I had a family I wanted to put my all into. ...And I had a passion -- my painting -- that I’d firmly set aside to make those things happen. What I told myself: It can wait for later. Now let’s bring it back to present day. My design career evolved into my own business that I’ve run for more than 15 years. My kids are both grown, graduated from college, and living on their own in California and New York City. ...And up until not too long ago, my painting was still set aside. I couldn’t possibly paint every day -- it wouldn’t be a responsible display of my priorities. I couldn’t possibly build a business around my art -- it would never be able to support my family. I couldn’t possibly take two weeks off to paint in France -- I’d lose design business. It could all wait for later. Instead of getting curious about my dreams and asking what if?, I shut the door out of fear. What if “later” is a bad word? I had to get curious about what was possible now, not resign myself to later. I had to get curious about the possibilities, and start asking what if? I had to get curious about what foundation was needed to make those bigger dreams happen. Could I paint every day? What if I started weekly? Could I build a business around my art? What if I start a website? Could I take two weeks off to paint in France? What if I join a painters’ workshop who travels? Getting curious about what I could do in the present opened me up to the “what ifs” that would bring those future dreams to life. Just a few years later, I paint nearly every day. I’ve built a business around my art. And I spent two magical weeks in the south of France for the sole purpose of painting. And in so many ways, this feels like it’s just my beginning. It has me curious: What have you designated for later that belongs in the now? What if you get curious and ask what if when it comes to your dreams? Not long ago, I embarked upon my own version of Wild: two weeks of unfettered painting in the hillsides of France. As I carefully packed, I reflected on the fact that the best supplies are important to support the work we want to create. Without my much-loved pack, easel, paints, boards...painting en plein air would not just be more difficult; it would be less enjoyable. Yet while physical tools are necessary to get the job done, they’re a secondary necessity for creativity, only working when we first have the essential intangibles in place -- in particular, the mental muscles that create an impenetrable foundation for creativity. The mental muscles I’ve found most important to hone are ones I’ve also written about several times before, in different ways: Courage. Curiosity. Persistence. When fear makes us question whether we’ll fail or whether we’re good enough. When ego makes us question whether anyone else will like our work; whether it will be accepted. It’s in the face of fear and ego that we need the courage to embrace stillness and focus inside. When our inner naysayer rears her negativity and imposter syndrome has us wondering who we are to do this work, we need the courage to put our soul on display. When we’re tempted to keep our work under lock and key, depriving it of its chance to be seen, to be improved, and to grow, we need the courage to show our vulnerabilities and practice gratitude for those around us. 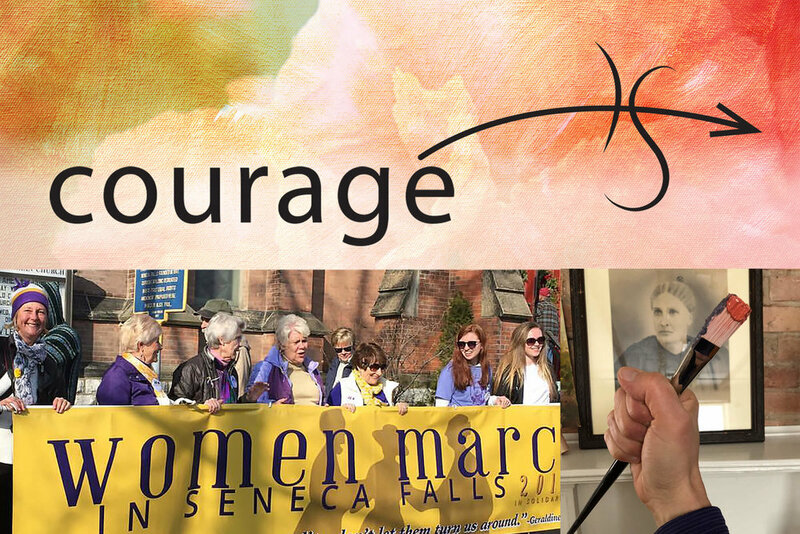 When we’re determining how we want to live and what that looks like, we need courage to make choices; to have conviction. When the busyness of life sets in and we’re feeling just a little too “adult” in both creativity and personal matters, we need curiosity to light the childlike exploration that forgets rules, relies on more than learned skills, and lets imaginations wander. When we are in a constant spiral of to-dos and anxious to check the next thing off our list, we need curiosity to encourage us to make time dedicated for exploration without an end goal. When we’re on our way to burnout and creative blocks begin to set in, we need curiosity to burst open our minds and take us to a place where adventure leads and little miracles follow. When we’re distracted by the plethora of ideas known to any creative who loves to dream, we need persistence to complete the projects that are already lighting our fires. When we’re tempted to give up because of overwhelm, because of fatigue, because of fear...we need persistence to seek both the internal and external validation that keeps us going. When we aren’t confident in our path or the work we’re creating, we need persistence to remind us that art is a generous act, and that someone, somewhere, needs what we are creating. The importance of each of these cannot be overstated. Likewise, they cannot be compared -- without curiosity, courage and persistence lead to hustle without exploration. Without courage, curiosity and persistence lead to exploration without conviction. And without persistence, courage and curiosity lead to fearless wandering without consistency. Building courage, curiosity, and persistence is lifelong work that amplifies our creativity and the work we put out in the world. That creative work? It’s a gracious act; the tangible manifestation that shows the courage, curiosity, and persistence are worth working for, no matter your creative pursuits. Because the world needs more creativity. And that creativity requires courage, curiosity, and persistence. As a perpetual student of life and art, one of my absolute favorite things to do is witness other painters when they’re in their flow. I’ve now seen many masters at their craft, but most recently, I saw a demo by Sara Linda Poly, the night before her fantastic workshop at this year’s Finger Lakes Plein Air Festival. Despite her mastery, her complexity, and her skill, the thing that struck me most about her process during the demo was also the most simple: She took it slow. From prepping her canvas to mentally measuring the light and setting her mindset to taking the first stroke, she approached everything with a certain sense that I, at first, couldn’t put my finger on. At her easel, she was fully present. There was no sense of urgency, no hurried strain. She emanated calm. It’s something that’s stuck with me since. Slowing down doesn’t come naturally for me. With light and shadows moving so quickly and so much beauty to capture whether painting en plein air or in the studio, I often feel that urgent pull in my chest to make my magic happen. Yet here was Sara, not just in her demo, but in her workshop, encouraging us to slow down. Even though we only had two hours to paint. Even though we only had one day with her. Even though we were attempting to learn and accomplish so much. Isn’t that always the case, though? In life, as in art, isn’t there always more to do, more to learn, more to accomplish? Our lives will continually move ever faster and our to-do lists will grow eternally longer, which makes it more and more important to do what Sara demonstrated that day: To slow down. To focus on the present. To concentrate on the essentials of now. This lesson came back to me when I saw the above clock at a restorative yoga class recently. I caught myself thinking about the next thing -- what was to come after class; what was waiting for me at home; what I hadn’t gotten done earlier. I refocused. I stayed present. It was a breath of fresh air; a sigh of relief. For me, embracing the essentials of now means being fully aware of where I am in each moment -- appreciating the smells, the sounds, the scenes, the people around me. It means focused attention. It means taking the time to get into my state of flow, knowing that while there’s always more, it’s the now that matters most. Still, slowness doesn’t come naturally to me. Presence is a perpetual practice, that will never be perfect. But it’s worth putting the work in for, don’t you agree?